In a press release, Oculus has announced the launch of the Oculus Venues app for Gear VR and Oculus Go headsets. With the Venues app, users can watch concerts, sporting events, stand-up comedy, movies, etc. live in real time in immersive virtual reality. The app was first announced at Oculus Connect 4 last year and made an appearance again at Facebook’s F8 conference this year. As with everything from Facebook, the app is high on social features. It allows users to connect with family and friends and watch live events together. By opting for social sharing, users can even meet new people based on common interests and mutual friends. To ensure a safe and comfortable social environment, the app comes with tools to mute or block users quickly and seamlessly. For those who prefer to watch the live events alone, the app also offers a solo-viewing mode. Since compelling content is critical to the success of a VR offering like Venues, Oculus has lined up a long list of live events in the coming months. 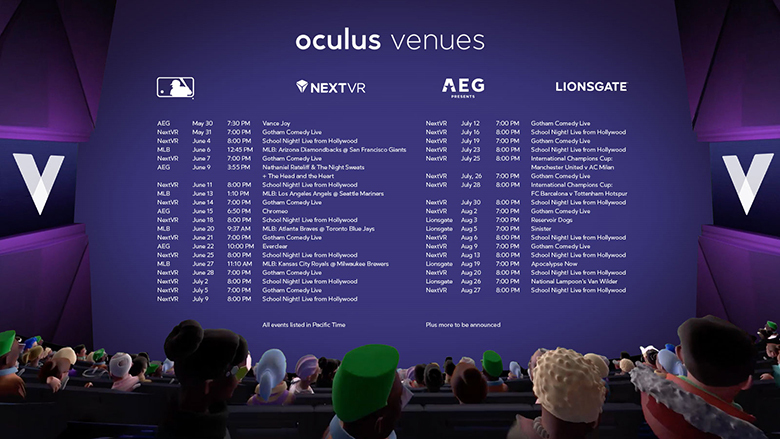 Oculus has partnered with NextVR to bring many of these live events to the Venues app. Apart from the below events, Oculus is also promising content from Showtime, Lionsgate, NBA, NextVR, etc. later this summer. Users can view the full schedule of live events available in their area in the Oculus Venues app. Gear VR users can download the Oculus Venues app starting today.